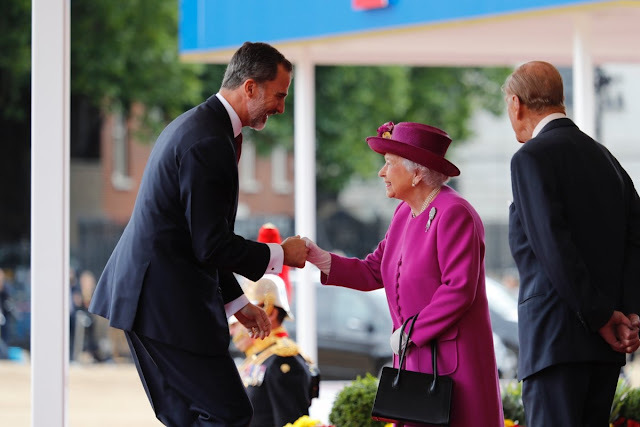 The Queen and The Duke of Edinburgh welcomed King Felipe VI and Queen Letizia of Spain at the beginning of their State Visit to the United Kingdom. 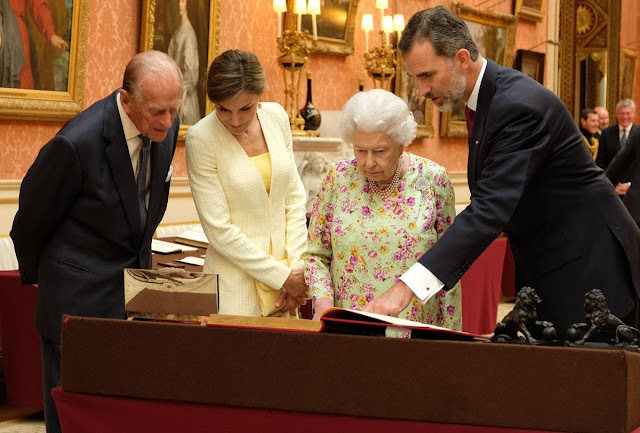 The Queen has hosted state visits from King Felipe VI's parents and from his maternal grandparents during her reign. A triple generation State Visit tradition! Just one of the fun facts you get when one of the world's longest-reigning monarchs meets up with one of the world's newest monarchs. The classic Shell Brooch was on duty today, shining brightly from her magenta coat. Her Majesty matched both His Majesty (nice tie work, Felipe!) and the other Her Majesty, Queen Letizia's yellow ensemble coordinating nicely with the yellow accents on this Rachel Trevor-Morgan hat. The queenly pair really stepped up the coordination game once inside Buckingham Palace for lunch and a gaze around the Royal Collection's special State Visit exhibition, because the yellow flowers on QEII's dress really stand out. As usual, the brooch was transferred off the coat to the dress beneath. The Duchess of Cornwall was an array of her usual favorite jewels and her usual favorite ivory shade and her usual favorite statement hats ("statement" being an understatement in this case) for her part in the welcome ceremony. Her Diamond Stick Insect Brooch is said to have been a gift from her late father, and it is one of her favorites; we have not yet covered it here. 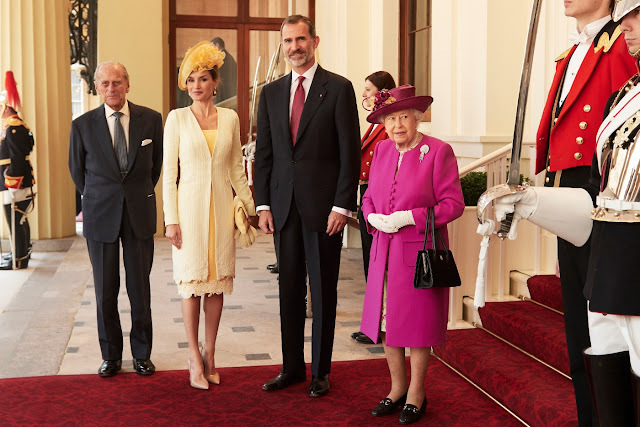 In case you aren't a regular reader of the other blog, you'll find right here an open post for Day 1, with full coverage of Queen Letizia's outfits from the day as well as a livestream link and details for tonight's state banquet. Come on over!